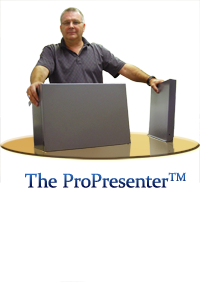 The ProLectern™ (our compact presentation podium stand) as it compares with it's three leading (non-portable!) competitors is seen below. The following chart compares "apples with apples" and should be considered for reference only. It's totally portable because it is remarkably foldable. It's easily carried, fantastically brilliant, and simple to setup and tear down. It has all the features of it's competitors, plus half a dozen more! The Portable Podium™ is Fundamentally Foldable. The Portable Podium™ folds thin with silent grace. There is no removal of pieces, no disassembly, and no loss of time. It's all one single piece. There is no "breaking away" or yanking, pulling, or wrestling with your lecterns podiums. We wanted to optimize your experience while packing up your podium, so we designed this item to graciously fold and unfold seamlessly with strong but mostly hidden hinges. When it comes to podiums for sale, we realize that you have many choices, that’s why we designed The Portable Podium™. And because we get our podiums direct from the factory, we’re able to pass on the savings to you. Patent pending, the Portable Podium™ makes setup a breeze. Ten seconds and you are ready to start talking. Do you "referee" between your car and your podium in the garage before your speaking engagement? Do you get headaches trying to tow your heavy podium up or down a staircase? Or perhaps you have to "borrow" someone from maintenance to get your speaking equipment from point A to point B? Even if you are not in one of these situations, could you use a podium that was a little more user friendly? Once you begin carrying the podium around on your college campus, church facility, corporate headquarters, or government agency, you'll begin to feel the advantage of being portable. The Portable Podium™ folds up into a rectangular box that makes for easy transport with fast setup and teardown. 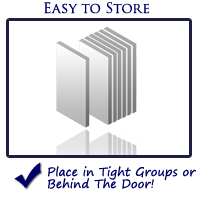 And best of all, the folding lectern has revolutionary lectern plans, it is all one interconnected network of sleek and stylish aluminum--no storage of multiple parts, no hunting for missing appendages. It all stays together for your convenience. Conveniently carry your Portable Podium™ to your next speaking engagement at a conference, across campus, or a few city blocks. Our portable lightweight podium and carrying bag should be light enough for almost anyone to be a mobile speaker! This portable lectern is both lightweight and sturdy, giving you the best features of pressboard, without all of the drawbacks. 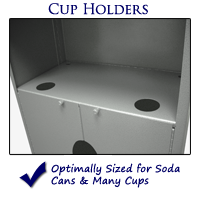 Best of all, you already have a place to store it; in fact, every room has a place to store these portable podiums . . . behind the door. Try fitting your heavy and bulky pressboard podium behind that door--it's not going to happen! The Portable Podium is totally collapsible and easy to carry. It's easier on your back. 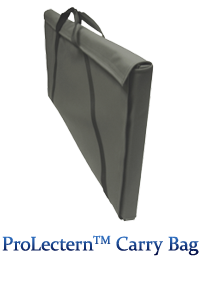 How many quality podiums can you recall being carried in a nylon bag or hung on a wall? Can you think of even one? How often have you seen someone carrying a podium across campus? Up and down the streets of Chicago, New York, DC, or LA? Where have you ever seen a podium being carried like a sports duffel bag!? You could put this podium on your back in your Vinyl Carrying Bag and take a walk on the beach--or at least across campus or a few city blocks. Because It's Foldable, You Can Store It Easier. It fits in your trunk. It fits behind your door. It fits in the attic, in the office, even under the bed! The only place it wont fit is your wallet! Every household, school, office, or workplace has a space for the Portable Podium™--behind the door! Our portable podium stand design hangs on the door or sits behind it, making for an easy retrieval. How much space do your podium(s) currently occupy? Do you have a convenient place to put it (them)? Or are you filling entire rooms in your facilities with lecterns and podiums that otherwise go unused until needed? Try the Portable Podium™ instead. You do not need to build onto your facility. Dump your space hogging podium set and adopt the classy Portable Podium™ instead. Don't kid yourself, there's nothing else like this on the market--anywhere (patent pending)! 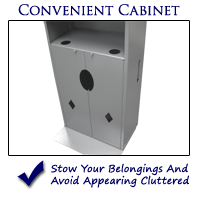 The Portable Podium™ is perfect for large organizations that want podiums available for speakers but do not want to keep hundreds of podiums stored in rooms. 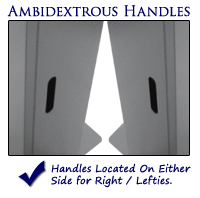 Rather, you can keep your speaker podiums on doors--close to the actual working environment of the speakers. Alternatively, it can be slid out of the way in virtually any nearby closet or just set on the floor behind the door. If mass storage is necessary, simply store them together. 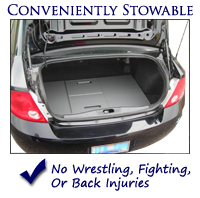 Large corporations especially can take advantage of the easy storage. For example, rather than keeping a large number of bulky podiums in a storage room, a corporation can assign a computer podiums to each cubical or office, where the podium can be hung on a wall, door, or placed beside or under a desk. This frees up space for new servers, more cubicals, offices, and more important infrastructure. It's a great way to "add on" to your facility without the enormous cost and inconvenience of construction. The Portable Podium™ is sales ready and feature packed. It's a veritable public speaking tank--with coffee cup holders to boot! Your Coffee Cup Holders Are an Oft Overlooked Necessity. Most speakers like to keep a pop can, bottled water, or coffee cup nearby. Perhaps you or your colleagues are currently placing your pop cans, coffee cups, or water bottles just about anywhere they will fit. We've all seen drinks placed on the sides of a podium or lectern (hanging slightly over the edge, just begging for an opportunity to fall), held in the hands, and even placed on expensive equipment like projectors and laptops. Having your drink sitting out there in the open can be distracting. Speeches can get interrupted when the drink takes a dive, requiring someone (if not yourself) to scrub up the mess. Then you've lost your audience. The Portable Podium™ boasts two coffee cup cavities (right and left handed) where your drink(s) can sit while you speak! Built-in Cabinet to Store Belongings & Avoid Clutter. 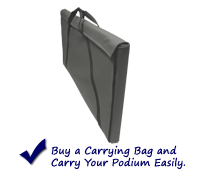 Keep your personal articles such as briefcase, purse, hat, coat, or computer out of sight. The lectern or podium cabinet allows you to store your personal items away from onlookers, making your speaking atmosphere and backdrop look and feel less cluttered. This gives you a feeling of being more prepared and gives your audience a more professional first impression of you. Use the cabinet to stow or temporarily hide any items you want to keep hidden from your audience until the proper point in your presentation. Read 9 Reasons You Need a Portable Podium to get a feel for why we believe our podium will help you get your job done. The Portable Podium™ boasts two media wire ports for your electronic equipment, be it projector(s), computer(s), microphone(s), or whatever your application might require! We have all seen it. Speakers who have a computer on one side, a projector on the other, a podium in the center, wires everywhere (tripping hazards galore), and a few drinks sitting in precarious places waiting to "dive bomb" their expensive equipment. 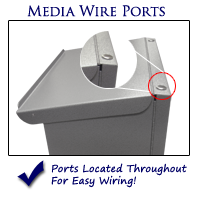 Cut through the wire mess with a few simple wire media ports in your podium. The ports are in the top of the podium and in the shelf, so you can have your computer, microphone, or other small electronic equipment units stowed inside your podium. Clearing away visual distractions will help your audience focus on you and will make you feel more relaxed. The podium stands about 40" tall and 20" wide and 14" deep when fully unfolded. You Can Use the Ambidextrous Handles for Easier Carrying! Some lecterns & podiums that have attempted to be more portable have still lacked one essential ingredient for a convenient carry: handles! There's no alternatives, folks. You've just got to have them! Some podium designs actually have the user bridging the entire width of the podium to hold it from the bottom. The handles are ambidextrously located on both sides, making it easier for lefties to carry it. This also saves a few seconds of time if the user does not want to waste a moment by turning the item around 180 degrees to get a better grip. Each handle is a practically weightless extension of the podium body, not adding any unnecessary mass to the overall weight of the portable podium. The fact that podium has handles is only slightly outmatched by the fact that it is one of the lightest portable podiums in the world! The Portable Podium™ weighs roughly a third of the average pressboard, acrylic, or glass podium, making it one of the lightest, fully featured podiums in the world. Compare material types. Do you "wrestle" your current podium(s) into place? That's over folks! Our full size lectern weighs less than 22lbs, and our tabletop lecterns weigh less than 9lbs. We recommend you compare our podiums with others on the market. We know ours will win every time. We're so certain, we will give you a full 30 days to try our product. Any problems and you can return it for refund! Americans oftentimes associate lightweight with low quality. But the opposite is true in the case of portable items. For anything portable, you want a sturdy, full featured item that has an appropriate weight for carry. But don't make the mistake thinking that your perfect portable podium would weigh nothing. 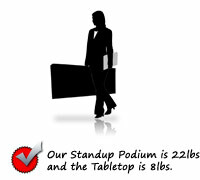 We kept the Portable Podium™ at a reasonable 18lbs to maintain excellent stability. We have achieved an industry standard with our new design. If you can carry some groceries (maybe two gallons of milk) out to your car, you can carry the Portable Podium™. Some podiums weigh over 120 pounds. This renders the average podium completely unusable to traveling & mobile salesmen, preachers, teachers, and many public speakers. Usually you are at the mercy of whatever is supplied to you at your speaking engagement (i.e. a floor lectern), which may or may not be what is needed. You need a podium that is lightweight for carrying. That's why our design incorporates some of the strongest and lightest material in the world without compromising strength or durability. Try carrying your average pressboard podium across campus or even across your own office! Do you already feel the sweat just thinking about it? Enter the Portable Podium™, your solution to long distance public speaking. 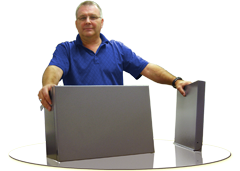 The Portable Podium™ is made of durable aluminum, which renders it strong and lightweight. Don't settle for wobbly, unstable podiums that are as heavy as a kitchen table! We strive to make an excellent product. We care about the quality and effectiveness of our products. Pressboard material fades with time, warps from spills, and shows signs of aging with use. 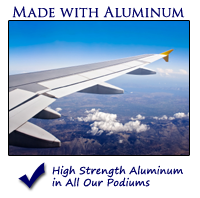 We chose the material used by the aerospace industry for high durability & strength, having a proportionately extremely low weight-to-strength ratio. In addition, you’ve got options when it comes to colors and materials. Whether you a looking for an eagle lectern, a black lectern, a wooden podium, or something custom, we’re here to help you find what you need! The Portable Podium™ is a single structure of interconnected surfaces, making it easy to fold and unfold. There are no "parts." The whole podium is one single, solid, interconnected folding structure. Click on the picture to the right to see an example of our product unfolding. We expect you will be impressed! The Portable Podium™ looks and behaves just like a "normal" podium, but when folded, it's only 1.5" deep and 18lbs, small enough to be carried in our Nylon Carrying bag and flown or shipped coast to coast at a nominal low rate. It stows so thin, you might not guess what it is until unfolded. It's not a fair fight! Glass is heavy and breakable if dropped; acrylic is as heavy as glass; and pressboard is also heavy but susceptible to spills, wear, and aging features. Aluminum is light and durable. We use the same series of aluminum alloys in our designs that you find in the aerospace industry in order to give you the edge in portability through a light and durable structure. Check out our product comparison to see the major differences between our competitors and the Portable Podium™. The Portable Podium™ cleans up like a kitchen countertop and looks professional. The premium finish on the Portable Podium™ results in easy cleanup for food spills such as corrosive pop or staining juices, coffee, tonics, and water, so podiums lecterns won’t be damaged. Pressboard will fake, peel, bubble up or warp. The finish on the Portable Podium™ means your podium won’t fade if left in your vehicle in the sun to bake. It is essentially sun and spill resistant. You could even dunk this podium in a lake without any permanent damage. And by the way, don't think our premium default finish is the only option. 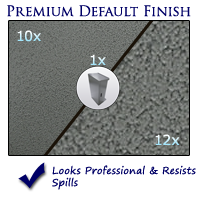 Literately thousands of custom finishes are available for corporations, universities, churches, and even governments! Made with a Cincinnati CO2 Laser! We here at ProProducts™ have a vested interest in America--we live here! And so we manufacture our products with American technology, American workers, at American facilities. We buy American. We encourage you to do the same! Please whatever you do, please do buy American. We deeply value your input as to what sorts of features you would appreciate in your Portable Podium™. If you have a suggestion for our engineering team, please contact us at feedback@portablepodium.com.